Delicate Arch is located in Arches National Park near Moab, Utah. 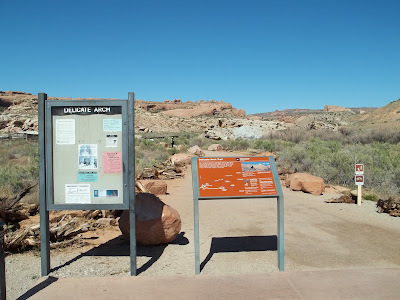 Arches National Park is about 100 miles from Grand Junction, Colorado. 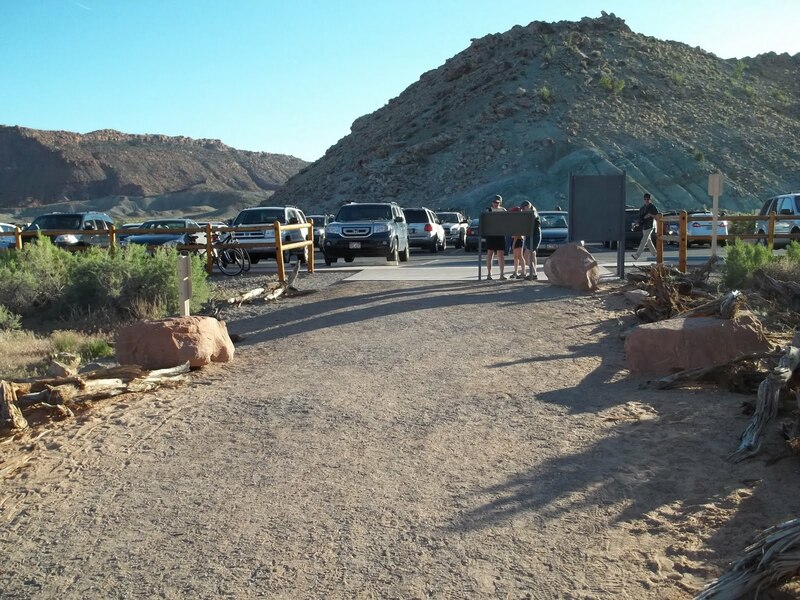 The Delicate Arch trail is a classic hike enjoyed, every year, by people from all around the world. The trail is moderately steep with an elevation gain of over 500 feet. That isn't much for the locals who are accustomed to hiking in the area but the casual hiker may feel a little strain. The reward is worth the effort though and after all, only half the hike is uphill. It seems the park service manages to make some improvements every couple of years or so to the trails in Arches National Park. Now that the park has topped the 1 million visitor number they should have no problem keeping the place looking nice. During busy times you may find both the main and overflow parking areas full. Especially around 9 AM and 6 PM. There are plenty of other arches to visit while you are waiting for vehicles to clear out so don't loose faith and keep checking back. The trail to Delicate Arch begins by passing the cabin and corrals of the Wolf Ranch. 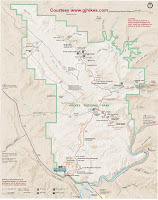 Some maps, including one with my GPS, show this as the Turnbow Cabin. Marvin Turnbow was the ranches second owner and helped with the geological survey of the area. He apparently put his name on the map at the time and as a result some maps still carry it. There is a nice new bridge crossing Salt Wash. The bridge is anchored to a large boulder in the middle of the wash for support. 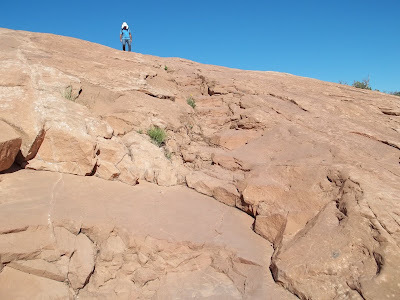 After crossing Salt Wash the first section of climbing begins as the trail switchbacks up and over a hill. A friendly little Rock Wren was fluttering about the edge of the trail. The small bird gets its name due to a curious behavior of lining the path to its nest with pebbles. 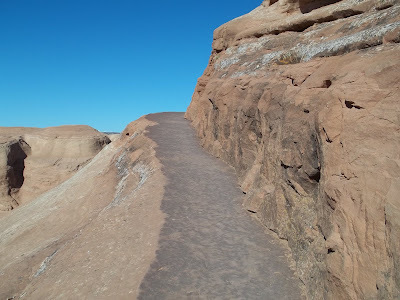 After crossing another wash the trail begins its ascent up the slickrock. Some steps have been hewn into the sandstone in this section of the trail. 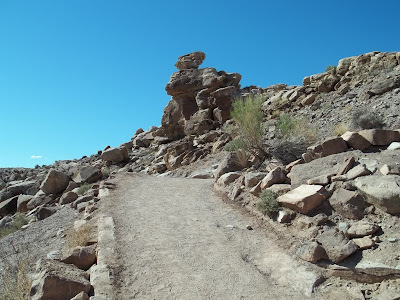 To stay on the main trail all you have to do is follow the rock cairns. 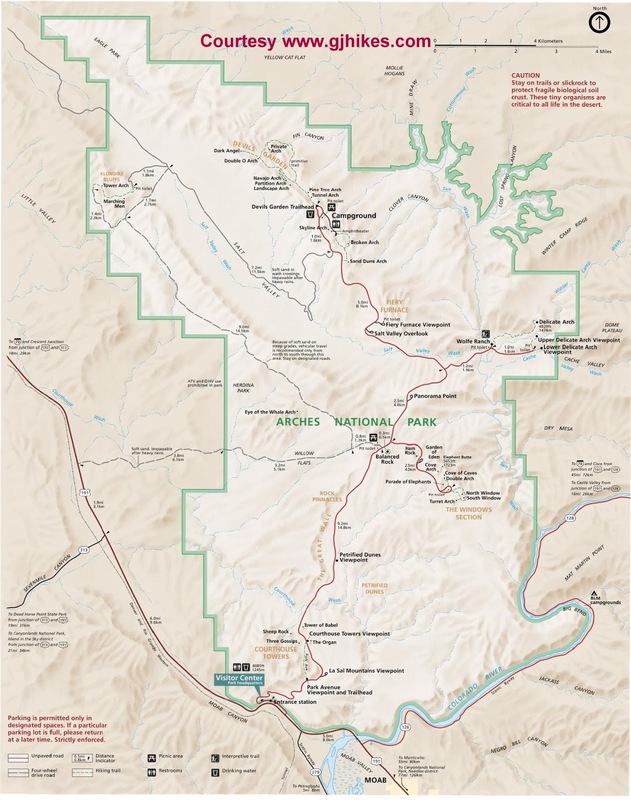 If you get to far off to the right you will miss the main trail and the hike will become considerably more difficult. Near the top the trail follows a broad path around the mountain. I always marvel at how flat and smooth the trail is. It looks like they blasted the rock away and then polished it to remove all signs of the drilling and blasting. Delicate Arch is picturesque any time of the day but many visitors like catching it at sunrise and sunset. In this photo the snow capped La Sal mountains can be seen in the background. 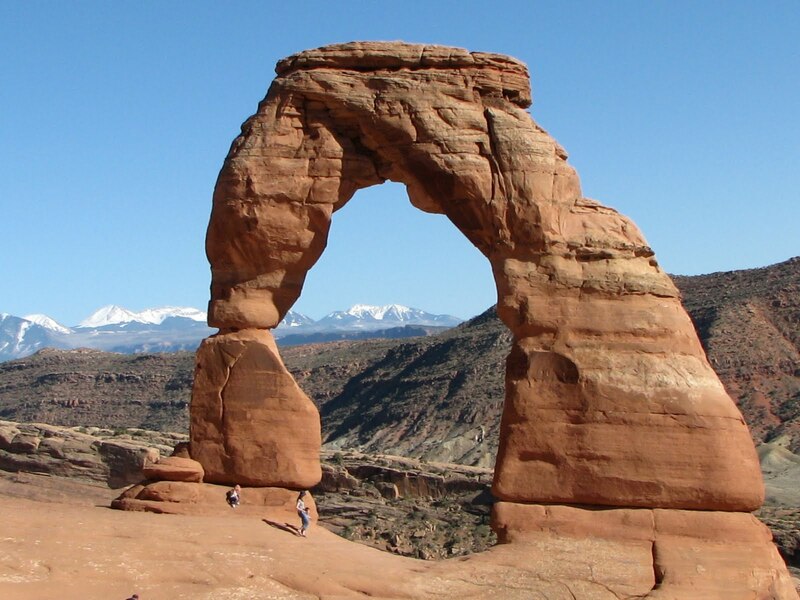 The arch sits across a large bowl in the sandstone that forms somewhat of a natural amphitheater. 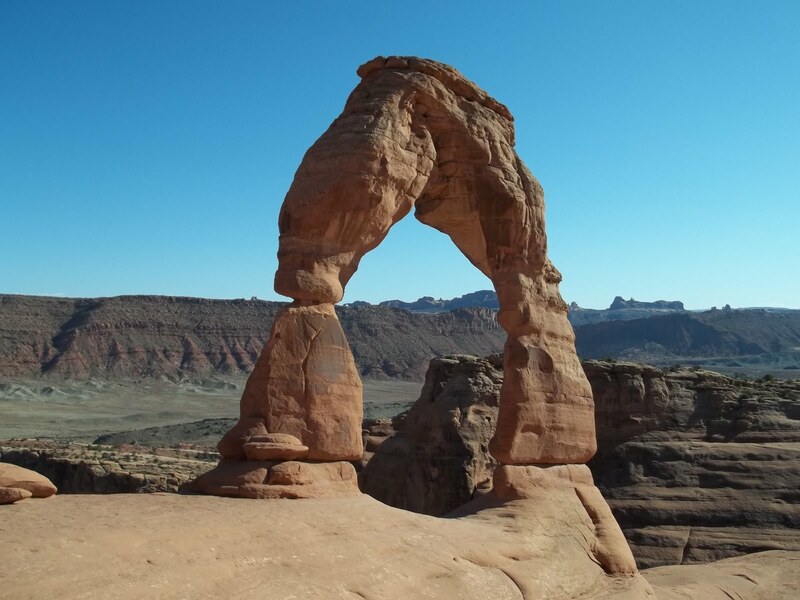 The state of Utah seems to have done their best to make Delicate Arch the most well known symbol of the state and it is said that it is the most famous arch in the world. The hike back down is taken with much greater ease. The steepest section of the trail only lasts for about 1/2 mile and most hikers seem to tolerate it well by taking a rest or two. 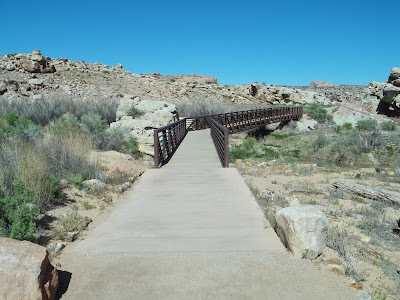 At the bottom, just before crossing back over Salt Wash, there is a little detour you can take over to some petroglyphs. It only adds about a hundred yards or so to the length of the hike. 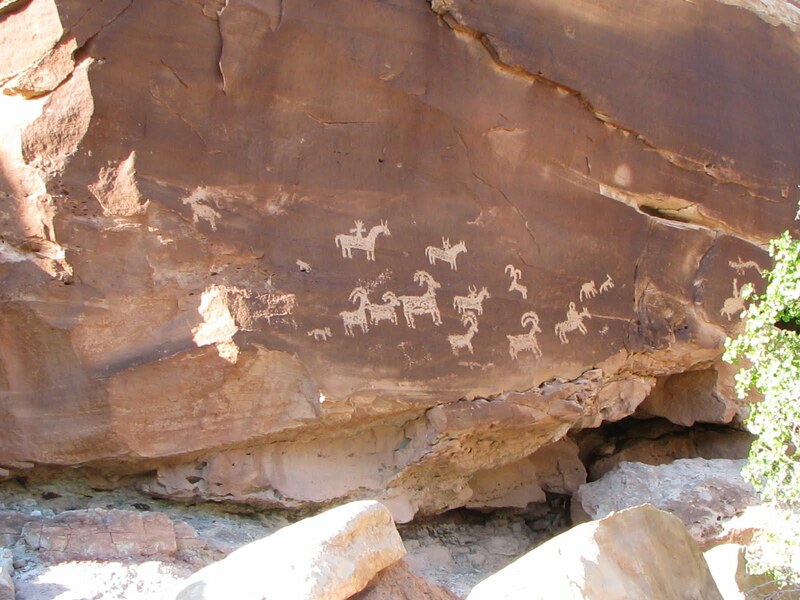 These etchings were made by Ute Indians sometime after 1650 when they had been introduced to horses. 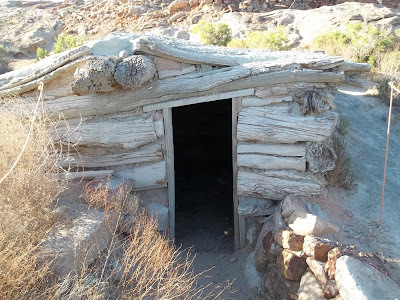 It looks like bighorn sheep were present in the area even then. 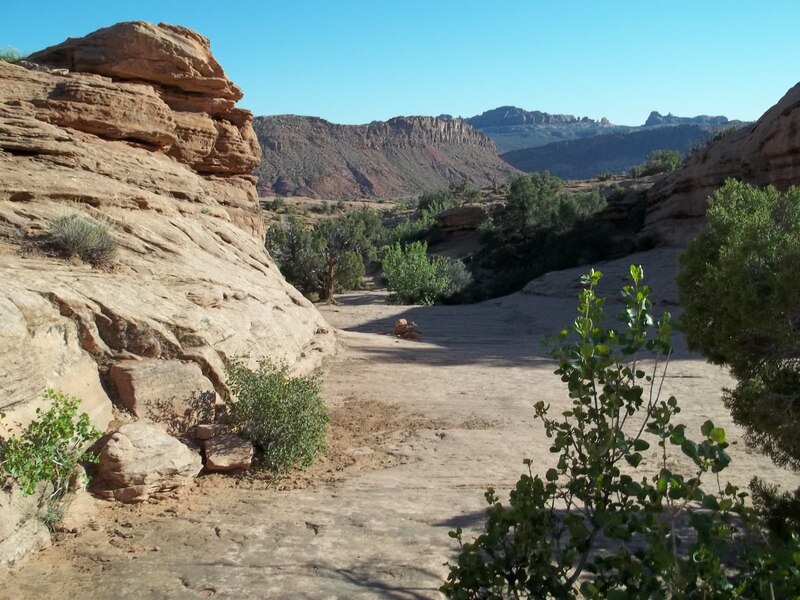 During warmer weather you will want to be sure to bring plenty of water and you might want something to snack on while you are lounging around at the arch. The sun radiates a lot of heat off the sandstone. That coupled with the effort to make the climb will necessitate more water than normal. Delicate Arch attracts visitors every day from around the world. If you would like to see Delicate Arch for yourself then all you have to do is 'Take a hike'.